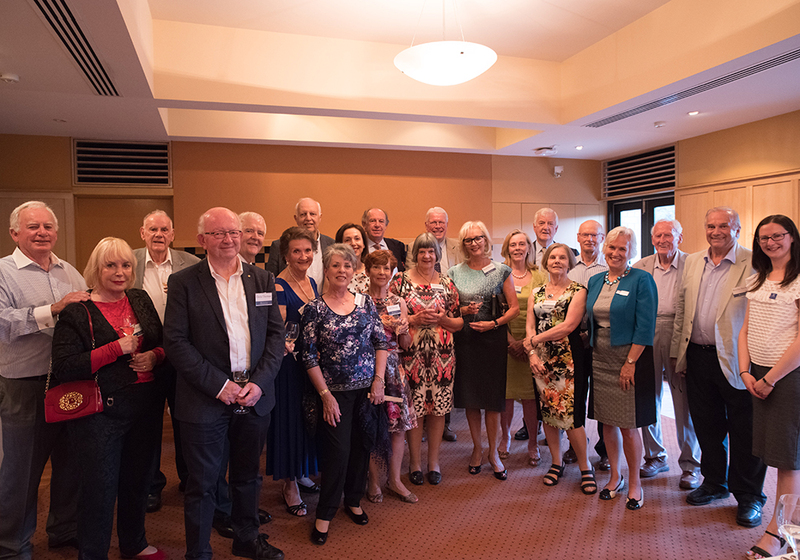 On 14 November 2017, 21 alumni, their partners and former teachers from the University of Melbourne (Commerce and Arts) Economics Honours Group that graduated in 1967, met for dinner, on the block where it all started half a century before. We toasted our University, our teachers, our parents and families who supported us, and missing souls, before sitting down to a three-course dinner, interspersed with reflections, reports, stories, poems, anecdotes and good cheer. It was revealing and pleasing to look back at living and working conditions half a century ago and to reflect on people’s personal and professional development. In 1967, books and hard-copy journal articles were mainly used, lecturers used chalk on black boards and occasionally wore academic gowns; notes were distributed by printing on roneo machines and other chemically-dangerous devices. There were no emails, internet or advanced projection devices; the only things ‘on-line’ were trains; ‘power point’ was a builder’s drill, and ‘social media’ took very different forms. Our event was supported by the Faculty’s Alumni Office, whom we gratefully thank. Since graduating in 1967, we have gone in different directions, all of us reaching success in fields of either finance and stock broking, accounting, management / consulting, academia and business. So much has changed, most especially the courses we studied. In the mid-1960s, only economics stood as the major avenue for honours study in our Faculty. Since then, honours degrees have become available in accounting, finance, economic history, management and actuarial studies. I had the pleasure to be the Economics Honours Degree Co-ordinator and economics research trainer at the University of Melbourne between 2011 and 2015. Having been involved with economics and especially honours-degree teaching at the University through that period, I can make some comparisons from an inside perspective. First, some things have undeniably changed and on any test, improved: the access to electronic forms of books and articles, reports, dissertations of other students has been revolutionary and welcome, though all of us can plead guilty to phases of inefficiency in using these resources. Secondly, econometrics has become a core component of economics courses, as have psychology / behavioural economics, though perhaps at the expense of economic history, philosophy and some literacy skills and emphasis. Further, the ethnic diversity of our students has been substantially broadened in the 50 years since 1967. Our student body was one third female in 1967 and a similar proportion reflected in the November 2017 Reunion Dinner. While mathematics became a pre-requisite for Commerce entry from the 1980s and has taken a large slice of undergraduate teaching in economics and other Faculty courses, it is not true to say that the standard of math was lacking in the 1960s honours program. A comprehensive account of the evolution of the Economics Department at Melbourne is found in the publication Balanced Growth (some copies are available from the Department: I wrote the 1970s chapter), the editor and driving force here being Ross Williams, who taught our group specialist mathematics in the 1960s and attended the November 2017 function. Let us revere the past, but move on and build upon it. View the photos from the reunion online.